After meeting up in the historic Third Ward, your guide will lead you on a 2-hour, approximately 1-mile walking tour through Milwaukee. 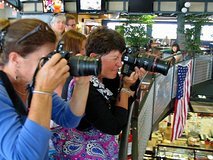 Throughout your tour, your guide will focus not only on pointing out some of the great sites of the city, but also on teaching you tips and techniques to taking more creative photographs. Learn about photo composition and the historical background of the city all at the same time. You will great sites, such as the Milwaukee Public Market, Wisconsin Avenue, the Art Museum and, of course, the lakefront. Each participant will receive a map highlighting some of the best photo opportunities on the route. Although this tour doesn’t focus on food, you will make a stop for some tasty chocolate along the way.